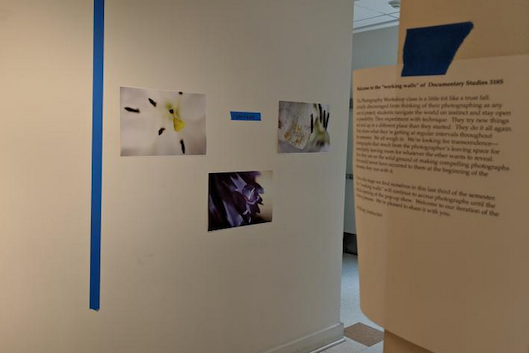 UExhibits-in-progress by undergrads in CDS instructor MJ Sharp's photography classes will culminate in pop-up shows at CDS on April 24: 10-11 a.m. Introduction to Black and White Photography, Porch Gallery; 2-3 p.m. Photography Workshop, University Gallery. "The Photography Workshop class is a little bit like a trust fall. Initially discouraged from thinking of their photographing as any sort of project, students navigate the world on instinct and stay open to possibility. They experiment with technique. They try new things and end up in a different place than they started. They do it all again. They show what they're getting at regular intervals throughout the semester. We all weigh in. We're looking for transcendence-photographs that result from the photographer's leaving space for serendipity, leaving room for whatever the ether wants to reveal. Once they are on the solid ground of making compelling photographs that would never have occurred to them at the beginning of the semester, they run with it. That is the stage we find ourselves in this last third of the semester. Our 'working walls' will continue to accrue photographs until the official opening of the pop-up show. Welcome to our iteration of the creative process. We're tickled to share it with you."